Since Roosevelt's administration installed the designs of the New Deal era in the United States, the role of government in the lives of the American people has transformed. Over the course of World War II and the ensuing intra-Cold War conflicts, the War on Poverty, the War on Drugs, the space race, and the arms race, the United States accrued a tremendous pool of liabilities in order to fund these extravagant projects. Following World War II, the United States and the major market powers agreed to Bretton Woods, which established the United States dollar as the benchmark for the rest of the world's currencies. The United States dollar was then denominated in units of gold, redeemable at the request of the bearer of those reserves on the international scene. By this time, President Franklin Roosevelt had already issued an Executive Order 6102 outlawing personal ownership of gold as money or hoarding thereof, but the United States dollar still operated from this system on the international scale. By 1971, the United States had long abused its privilege by expanding its money supply, or issuing debt it could never repay, in order to satisfy the whims of over-promising administrations. At the time, President Nixon elected to temporarily close the gold window, all in response to the requests for redemption of gold by its international creditors. This was, contrary to popular belief, a moment in American history when the United States government effectively defaulted on its debts and admitted its insolvency. Shortly thereafter, in order to artificially prop up the United States dollar, Nixon negotiated a system of mutual advantage with the government of Saudi Arabia which would grant the Saudis arms and protections through United States defense while Saudi Arabian oil transactions would be exclusively denominated in United States dollars. Subsequently, OPEC espoused this system and the United States government was thus permitted further extravagance with its inflationary monetary policy, over which period of time the United States dollar experienced an expansion of supply on the magnitude of greater than twenty-fold, while the dollar price of gold has soared nearly 5700%. Over the course of the past two decades, the United States dollar's global reserve status has waned and its hegemony has been threatened by OPEC nations' refusal to accept further trade in United States dollars, while some of the United States' greatest creditors, including China, have declared their reluctance to hold or accumulate further United States treasuries. This imperils the stability of the United States dollar, which is, of course, the lifeblood of the American markets. 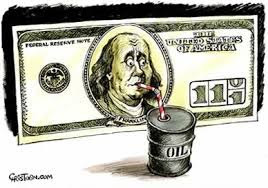 Without this stronghold upon the petrodollar system, the United States dollar will surrender its global reserve status and will vacate its position in the international market as a mere facilitator of trade and exporter of inflation. This is the basis of the war efforts in the Middle East today and the impetus for the largely acceptable propaganda Americans regularly observe and accept.